In spite of China’s venerable musical tradition, very few people outside the ‘Asian studies’ circles are aware the authentic musical heritage of the Far East, unless it is in the most superficial of terms. Mentions of Chinese music might conjure, at least to the uninitiated, memories of the cheesy (when not downright ghastly) ‘sonic wallpaper’ that will accompany a meal in most Chinese restaurants of the Western world. 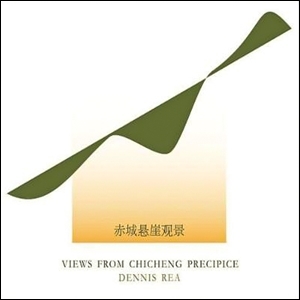 However, I am happy to report that Views from Chicheng Precipice – the first recording effort solely credited to Seattle-based guitarist and composer Dennis Rea, a true veteran of the progressive music scene of the US Pacific Northwest – is light years removed from any such kitschy scenario. Those who are familiar with Rea’s current main projects, the eclectic art-rock of Moraine and the improvisational jazz-rock of Iron Kim Style, will probably find themselves somewhat puzzled by this album – which, on the other hand, provides further proof of the guitarist’s broad horizons and dedication to the pursuit of creative musical avenues. While world music may be all the rage in a some circles, it is nevertheless not easy to find artists that approach the tradition of a country as distant (both literally and metaphorically) as China with such rigorously philological spirit as Rea manages to do – informed by his first-hand, in-depth knowledge of the musical and cultural background of both China and Taiwan, where he spent the years between 1989 and 1993. Recorded between 2006 and 2008, Views from Chicheng Precipice sees the participation of members of both Moraine and Iron Kim Style, as well as other musicians from the Seattle scene, such as Japanese music specialists Elizabeth and John Falconer, and trombone master Stuart Dempster. Running at under 50 minutes, the album features five tracks presenting different facets of the Chinese musical heritage, seen through the eyes of a Western artist in a respectful yet uniquely personal way. Indeed, four out of five numbers (the sole exception being the title-track) are traditional compositions arranged by Rea so as to preserve their spirit even when reinterpreting their form. Out of those five tracks, the East-West collision of “Days by the Sea” might almost be described as a pop song of sorts (also on account of its markedly shorter running time). Rea’s guitar weaves a tune that, while respectful to the original, incorporates elements of African-American blues, sparring with Alicia Allen’s violin in a stunning dialogue that brought to my mind Rea’s work with Moraine. The title-track, on the other hand, is built around three pentatonic motifs that comprise an original sonic triptych, with a recurring theme and plenty of scope left for improvisations. The composition was performed by Moraine during their performance at NEARfest 2010, though not many members of the audience were able to grasp its sheer elegance and grace in a live setting. Here the triptych comes across in all its understated power, the seamless flow of the music evoking the beauty of the titular mountain landscape (Qingcheng Mountain is the site of a Daoist sanctuary in China’s Sichuan Province). Rea’s guitar converses smoothly with Allen’s violin, while a drum-led improvisation adds a free-jazz touch to the central part of the composition. The remaining three numbers are of a distinctly more challenging nature, since each of them develops in a fashion that is definitely less attuned to the Western ear. The 15-minute “Tangabata” and the 10-minute “Bagua” both have their roots in ceremonial music, as borne out by their stately, measured pace. The latter makes use of traditional Japanese instruments such as the koto and the shakuhachi (a bamboo flute), supported by solemn yet dramatic percussion work in the creation of a gently meditative mood. “Tangabata”, though a far from accessible piece, might be called the real highlight of the album. While featuring a distinctly Western-flavoured, free-jazz improv section at its very end, most of the composition remains faithful to its ancient origins – a sparse melody of austere beauty, almost suspended in time, made of deep, echoing sounds occasionally brightened by chiming bells. Finally, in “Aviariations on A Hundred Birds Serenade the Phoenix” (whose gently punning title reflects Rea’s ever-present sense of humour) the Chinese oboe traditionally used in the titular piece is replaced by Caterina De Re’s piercing vocal acrobatics, mimicking birdsong in a performance that brings together contemporary Western academic music and Chinese opera. Rea plays guitar and kalimba, whose sounds almost merge with De Re’s impossibly high notes. Miles away from any tawdrily commercial ‘world music’ recreations, Views from Chicheng Precipice is, as Rea himself puts it, a love letter to the country where he spent four years of his life, an experience that was essential for his development as a musician. A refined, understated listen, it is an album made of subtle contrasts of light and shade, and as such needs to be approached with respect and concentration. The music possesses the delicate, almost brittle beauty of Far Eastern art, in stark contrast with the ‘in-your-face’ nature of much that is fashionable in this day and age. Being such an unabashed labour of love, imbued with profound feelings towards the country and its culture, sets it head and shoulders above the many blatantly contrived releases flooding the current music market. Those who will find themselves intrigued by the album could do much worse than get hold of a copy of Dennis’ book Live at the Forbidden City, a thoroughly enjoyable, extremely well-written account of his years in China and Taiwan – and a perfect companion to this disc. A special mention is also deserved by the stunningly minimalistic cover artwork and detailed liner notes – a simple yet classy package for an album that everyone with an interest in world music should check out.